HBW 2019 is the 5th - 9th of August! Signup Now! Whatʼs involved helping at Holiday Bible Week? Holiday Bible Week would not be possible without your help. Whether you have helped out at every HBW or you are interested in volunteering for the first time, we would love to have you with us in 2018! Working alongside children in arts and crafts and outdoor games. Being with the children and sharing the gospel with them. Oh and how could we not mention, toilet runs! If you have children that would like to attend too, they can be pre registered at the same time as you sign up to help. We would love to have you serving with us at Holiday Bible Week 2018. Please fill in the online form. We require all helpers to have a DBS from Holiday Bible Week which are valid for 3 years. If you DO NOT have a DBS from UKCRBʼs for HBW, and will be 16 or over during the week please fill in the helper form and we will contact you by Email after the cut off date to organise one. If you need a DBS please contact us at dbs@holidaybibleweek.co.uk or phone David King on (07785 958248) after 7pm for urgent advice. If you have any questions or problems, please send us an email. Holiday Bible Week costs around £25,000 each year. There are many ways that you can help us, and they don’t even have to cost you a penny… The easy way to help us is to start using Easy Fundraising. If you’d like to donate directly then please donate using our BT MyDonate link. 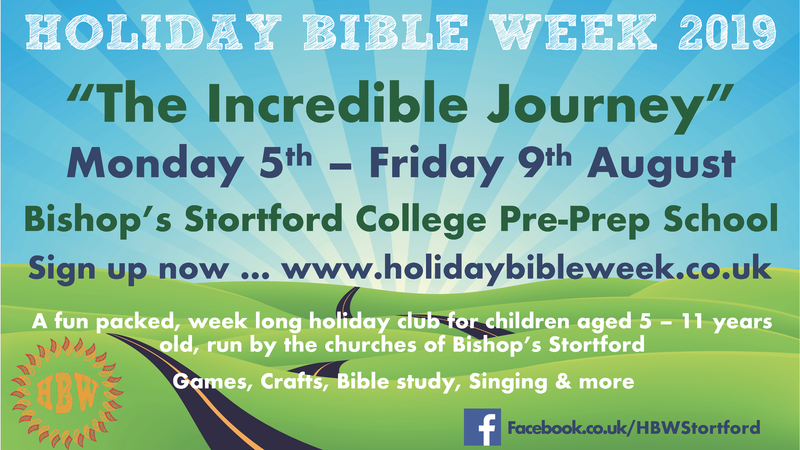 Holiday Bible Week is a community effort put together by members of churches all over Bishop's Stortford, Thorley and further afield. There's a central committee with members from these churches that meet regularly to plan and organise everything that is needed for each years event. As a community of churches together we invest heavily financially, in time and in effort to enable the 500+ children to take part in a wide variety of activities - all centred around Jesus Christ and the Bible. We have now run the event for more than 30 years. To build up relationships between the churches and the local community. To bring children into a caring and loving environment where they are valued and relationships matter. To present Christian teaching in a relevant way through the activities, and to reflect it in team relationships. To encourage the development of social skills and moral values. To introduce children to Jesus and the church. To provide interesting, stimulating and creative activities outside of the school environment. To offer the opportunity to develop new skills and discover new interests. To let children discover positive ways of having fun. To enable people from churches to work together and display true Christian unity. If you aren't currently a member of a church or are looking for somewhere new, please visit any of the above list. There's something for everyone and they'd all happily welcome you.